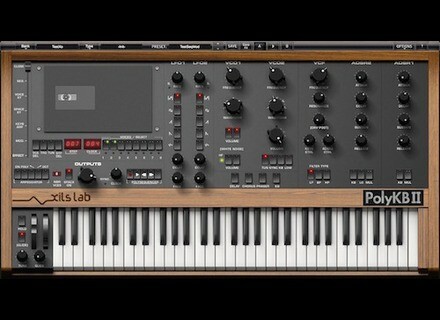 PolyKB II, Virtual Modular Synth from XILS-lab. The PolyKB mk II is described as "a recreation of a very rare and very powerful polyphonic synthesizer released in the 80's." 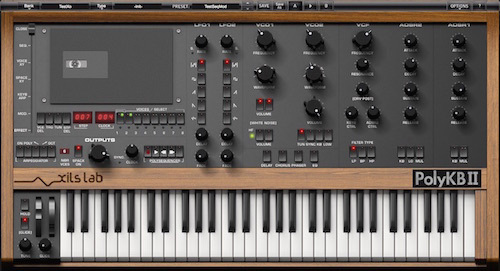 PolyKB II captures the sound and spirit of the legendary RSF PolyKobol Analog synthesizer including a continuous morphing Oscillator, which can be modulated by many sources. The PolyKB II is a polyphonic subtractive synthesizer based on two waveform morphing, aliasing free oscillators and a self oscillating 4 poles low pass filter. The oscillators take a large part of the sound of this synthesizer while the filter recreating a standard analog chip of the 80's (with the help of modulation sections), is designed to allow the PolyKB II to create warm sounds from basses to evolving pads, through "aggressive leads and thin crystal keyboards as well as a huge range of incredible special effects that sound designers will love to use..."
• All can now have a negative value applied (V1 always being positive), while an additional "Velocity Control Mode" now allows a huge dynamic range, according to XILS-lab. • The implementation of a Time Multiplier system allows all envelope times to be multiplied by x2, x3, or x4 — with a click. • The Arpeggiator now includes a Polyphonic mode, as well as Gate and Swing parameters. • The P-Myx Polyphony-controlled XY Modulation Pad can now send negative modulation amounts, allowing notes to sound different each time they're played. • A Polyphonic Sequencer now has a magnification tool and shift step function. • New patches will be available right after PolyKB II's release date. LiquidSonics Reverberate v1.660 LiquidSonics has updated Reverberate to version 1.660. Sample Magic Toolroom Records Samples 01 In collaboration with Toolroom Records, Sample Magic announced the first in a new series of label-themed packs on its new imprint, Sample Magic Presents. Makemusic! Finale PrintMusic 2011a MakeMusic has updated Finale PrintMusic to 2011a, a maintenance update for Windows and Mac OS X.